Interview: In his first major Chicago role, the Columbia College grad stands tall in the saddle as playwright William Inge’s brash wrangler Bo Decker. “Bus Stop” plays at Raven Theatre through Dec. 4. 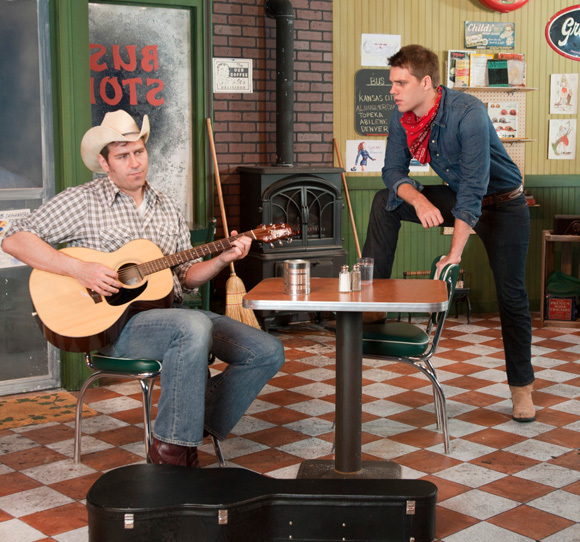 Michael Stegall, who looks and sounds every inch a ropin’ cowboy in the Raven Theatre production of William Inge’s “Bus Stop,” grew up in the West. No surprise there. But wait a minute. Not that West. The 6-foot-3, 23-year-old actor hails from Palm Springs, CA, where the buffalo do not roam. So how did this “city boy” (his term), who’s not even a western movie fan, crawl so naturally into the skin of Bo Decker, the rambunctious, untamed cowpoke hell bent on lassoing a pretty little lady in “Bus Stop”? But there’s a lot more than floppy boots to Stegall’s headstrong, intimidating wrangler. This Bo takes the stage by storm. He isn’t just swaggering and obnoxious; he’s dangerous, genuinely scary. Yet if so young an actor can play against type, that appears to be the case with Stegall as a roughneck. In fact, Stegall is the show’s fight captain. The one real knock-down-drag-out happens mostly out of view, but there’s a lot of rough stuff on stage and Stegall assisted choreographer David Woolley with that, too. Instead, Stegall engaged Bo as a blusterer who has some personal issues. He’s an orphan whose only true companion has been his pal and father-figure Virgil (Mark Pracht). He’s a strong lad of 21 whose willfulness and strength have always worked in subduing horses. 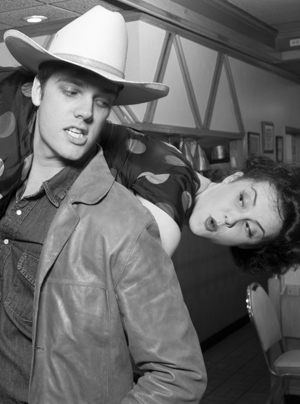 Then Bo finds out the hard way that he can’t just rope a woman. So what has this adept, yet still very young actor learned through the eyes of hard-headed Bo? I saw this play along time ago with a Bo who was such an over-actor that I left the play. I came to watch this play and I was outright maddened at Stegall’s Bo…but I didn’t leave. His character was so real and raw. What a great actor with a great cast. Two Thumbs Up!